I updated my list post from this past week and will rewrite a list of goals each week here for my business progress. 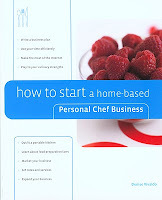 * Build a business notebook this week with customer information section, menu section and recipe section. Input all into computer and then print hard copy for new notebook. Later I will be adding forms for personal chef and such but for now I need a skeleton format to get started. * Set up one file drawer for business only... the other three are children and family, educational notes and papers and scouting stuff. * Sign up for CIA newsletter.. build a file in bookmarks with food sites that are sources of industry information and trends. * Be in touch with Michelle this week on information gathered and menu items available right away.